As holder of the Miss Prothero chair of this scattered family, never content unless she has provided something for someone, anyone, friends, family, firemen, acquaintances, passersby, to read, it’s been a heady month. Over at The New Yorker, its Daily Shouts editors must be panting like greyhounds, tongues lolling, with fresh outrage arriving on the half-hour. Not all of it has been Extra Superbly Choicest, but Rian Konc’s What’s In James Comey’s Memos? this very afternoon is a keeper, if it hasn’t gone viral by the time I finish here. RianKonc: What’s in James Comey’s Memos? What’s so especially nice about it is the way Konc has caught Comey dead-on, the small humble-brags with the guys “. . . probably also true that they didn’t invite me to shoot hoops with them because I’m ‘so good, it almost wouldn’t be fair.’” Also the faint prissiness, “Someone lit a bag of feces on fire and left it outside my door. . . “ that fits perfectly with Comey’s mildly nauseous constitution. It’s as though Barry Blitt were standing there at Konc’s elbow, making sketch after sketch of Session’s cookie-ready little face. But it’s the second half of that sentence that puts me away, because I promise you, the impulse – okay, well, yes, my crappy, lousy impulse – is to say, “ . . . not the director of getting cookies down from the top shelf” thus flat-footing the rhythm. I want to lay this perfection in Konc’s lap, not his editor’s, because he’s shown this good ear before (look up his New Yorker dossier) and, well, because it’s Writer Uber Alles in some damaged corners of this office. Although that’s another story. I think it was at that point that I became an Ebiri person. In his review, Ebiri is most deeply drawn to the counterpoint between the men’s work and their emotional, domestic lives. It shifts away from the way Mann likes to frame Heat, “as a contrapuntal, dialectical story” (which it also is) to consider the stuff that Ebiri seems instinctively drawn to, catching a quick, untethered glance between guarded bodies, touching the bedrock of people’s lives — the essence of what fascinates me about Ebiri’s own essential humanism. Could you have resisted wanting to know more, knowing everything possible about this ten-year old, homeless “enemy of the people?” Of course not, or you wouldn’t be here with me now. The first, selfish fact I grabbed from this surreal, crazed, triumphant story was that Petrushevskaya, born in 1938 (and 10 in that photograph) is very much alive today. Alive, alert, what the reviewer proudly calls “uncrushed” – hah! if you look at those eyes, crushing was never in doubt – in full voice and absolutely rocking her Madwoman of Chaillot hats. 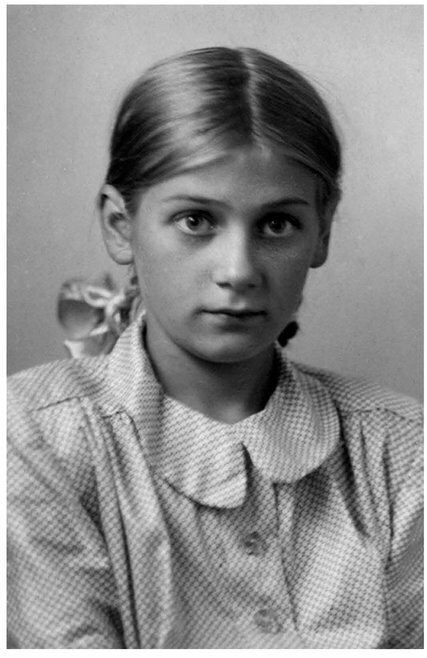 Who could do justice to the wickedness of her childhood? Today’s cutting- edge animators perhaps, who could show us how Petrushevskaya’s mother and her scrawny child slept under the massive dinner table in Grandpa’s room throughout their “enemies” time. Years. “Its legs were connected with a thick plank,” she remembered, “so that one had to sleep with her feet either over that plank or under it, which was extremely uncomfortable.” Finally, with a stretching string-bean bedmate, her mother tenderly arranged a bed for young Ludmilla in the common hallway, on top of Grandpa’s trunk. Her first time sleeping alone. From Mother Russia to Mother’s Day. My mother considered Mother’s Day a meaningless Hallmark/FTD money-grub. Dead right. Celebrating it at our house meant scrounging the day’s ripest, tackiest sentiments — the outsize cards, the heart-shaped pillows, the tiny bottles of cloying perfume — and presenting them for the outrage we knew they’d get. And proof of our cool. Oh sentiment. Oh principles. Oh motherhood. Want to see every hand-glued card I’ve gotten since 1956? Top drawer of my father’s desk in the bedroom. Mostly. Have to say, I’ve been giving the matter of mothering a hard look recently. A young, prolific film historian, Dr. Jennifer E. Smyth (American born, UK based) contacted me and my sister last year. In the course of researching a book on studio-era writers and women in Hollywood she’d become “fascinated and puzzled” by why Mary McCall, our mother, was so rarely mentioned in histories of screenwriting and the Screen Writers Guild in spite of her enormous work on both fronts. Scarcely a year from her first letter, my sister Mary-David Sheiner and I were perched on high stools at the Writers Guild Theatre for a tribute to our mother, complete with a screening of her adaptation of Craig’s Wife, directed by Dorothy Arzner. I think the night’s title, Madame President, picked last year, was supposed to be an echo of the country’s equal exuberance. Sigh. Let’s not go back there again. You won’t find a more succinct or impassioned case for a night of celebrating Mary McCall than Jennifer’s introduction.